The meteoric popularity of Chai Jing’s “Under the Dome,” attests to the Chinese public’s readiness for stronger environmental policies to tackle air pollution. Despite its banning last Friday, the documentary’s apparent support from certain branches of the bureaucracy, and increasing pro-environment rhetoric coming into this year’s hosting of the National People’s Congress and the Chinese People’s Political Consultative Conference (also referred to as the Lianghui) seem to suggest that change may be in the air when it comes to tackling China’s smog. What is less clear is what the hidden consequences of these efforts to combat urban air pollution will be. 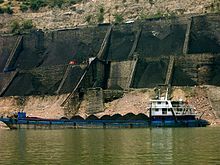 A fresh shipment of coal from western China. In September 2013, the State Council promulgated the Action Plan for Air Pollution Prevention and Control (APPC), which contained directives addressing China’s air crisis. These included a reduction in coal’s share in China’s energy profile to 65% by 2017, reduced capacity in high polluting industries like steel and cement production, and improved fuel quality standards. [i] The next year, Premier Li Keqiang famously declared “war on pollution,” spotlighting the issue as a top-tier policy concern. Regionally, the government has banned new construction of highly-polluting industrial projects such as coal power plants and steel factories in key cities on the east coast. However, the push to curb air pollution in Beijing is driving the coal industry westward, where massive coal bases are being established to feed China’s need for energy. Environmental activists are concerned that because of the massive quantities of water needed for coal processing — up to 20% of China’s water resources are used to produce energy from coal[ii]— the additional strain of a larger western coal industry may wreak havoc on water tables and food resources in a region already plagued by desertification. Distribution of coal reserves in China. Air pollution activists also have good reasons to be concerned about this trend. Northern China not only suffers from air quality problems arising from pollutants, but also from periodic dust storms that roll in from China’s northwest. Relocating coal plants, especially coal-to-chemical projects, and other water intensive polluters to these regions is an invitation for ecological disaster. Worse, Inter-governmental Panel on Climate Change (IPCC) projections show a potential for increased desertification in China due to global warming. Increased coal capacity will continue to threaten the ecosystems of northwestern China and thus the health of China’s citizens elsewhere. The specter of intensified dust storms descending on Beijing each spring should give those concerned about air pollution reason to demand strict controls on heavy industry and coal processing in northwestern China, not just in Beijing and its direct environs. The upshot of the energy development story in China’s northwest is that many of the same areas endowed with rich coal reserves are also blessed with massive wind resources. In the last decade, the central government has actively pushed for the development of wind power, resulting in a 73-fold increase in wind capacity since 2006. [iii] Moreover, the same electricity corridors built to accommodate China’s new coal bases will also serve large wind farms. Much, however, is still up in the air. Will wind power be given priority in power transmission eastward? Will wind power have the funding and support it needs? And what will be the consequences of China’s massive coal development in the west? These are questions that a concerned Chinese citizenry will need to address in order to breathe free.